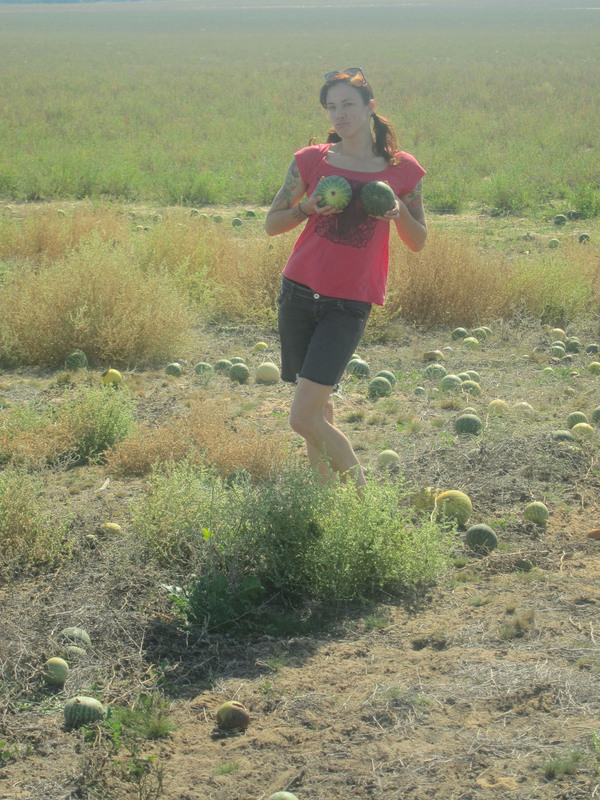 ON the edge of the Big Desert, feral pumpkins roam the land like unloved kids. At first we deduce some must have scarpered under the fence from a farmer’s field and made a break for it, but they’re bloody everywhere. They huddle at the sides of dirt tracks, make a run for it across great expanses of scrub and freeze when you turn around, so that they’re scattered like so many sinister pods in Invasion of the Bodysnatchers. 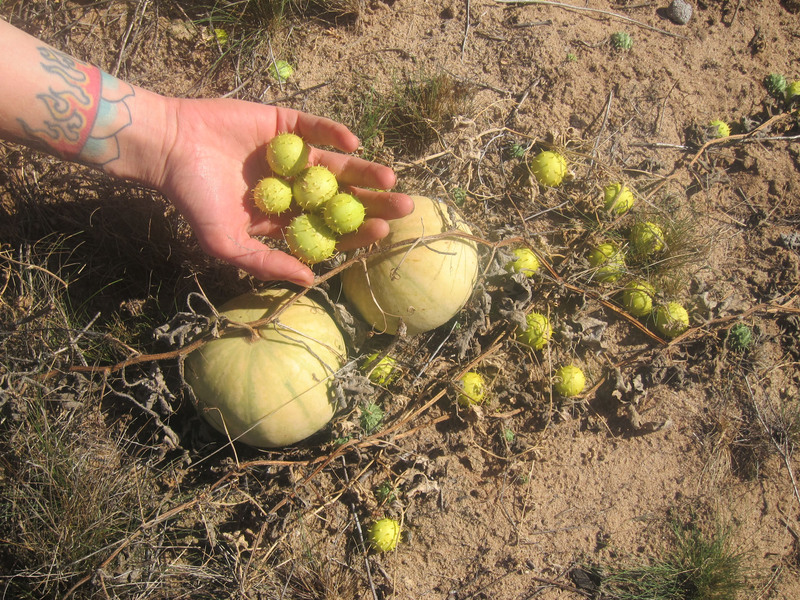 We jump out of the ute and break green globes free from their vines, fired up with joy as though this sudden glut of vegetables has taken on some magical significance. Scattered around are tiny yellow balls with soft spikes, like the useless toys you find up near the till in useless tat shops. We have a baby pumpkin fight and I squash one in my palm to lick it. It explodes like a tomato, but it doesn’t taste good. I climb up into the ute tray with the vegetable matter and hold on to the rack, ducking low-slung trees as the bush pirate goes chundering down Border Track, quite deliberately exploding rogue pumpkins as he goes. The main road between Victoria and South Australia is punctuated by a Fruit Fly Quarantine Station, which means the number’s up for our new friends. “Why is everyone so obsessed with our poisonous pumpkins?” one of the two uniformed women approaching the ute says incredulously. I can still taste deadly cucurbita on my lips. Suddenly we feel foolish for being so excited at our haul. “Roll them over there with all the others,” she says, pointing at the undergrowth where hundreds of pumpkins have already fallen. The border cops are nice enough though, looking after the rest of our hoard while we head into the nearest SA town to see what gives. You can’t blame them for being jaded – they’ve seen it all. 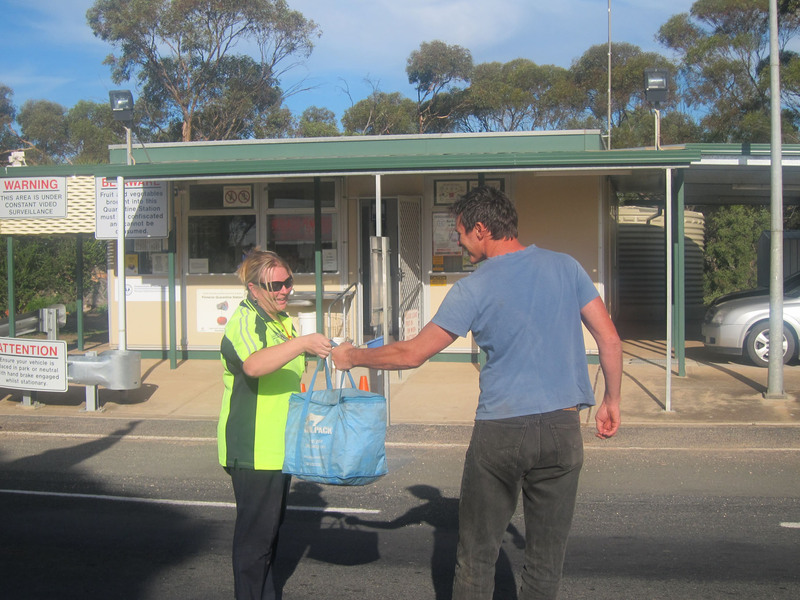 The neighbouring town’s a welcoming place, and we’ve a warm, fuzzy feeling by the time we pull up to the fruit fly quarantine station again. And here’s our friend with our cooler bag of dangerous salad leaves. “We’re going to tell people it’s full of cocaine,” quips the bush pirate as we take her picture handing it over. Keeper? Gone right off pumpkins.